Diesel locomotive series Y 8000 of the French State Railways. 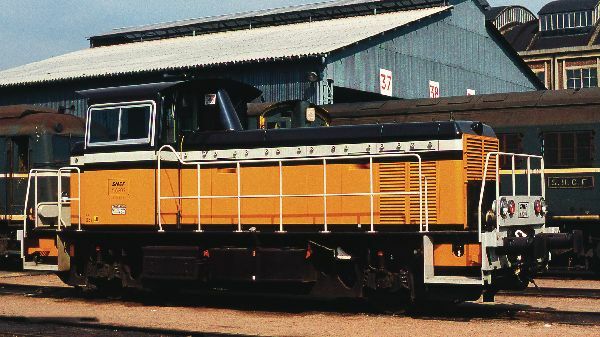 In July 1977, the Moyse factory rolled out the first shunting locomotive Y 8001 which was designed for shunting operations at stations, marshalling yards, construction sites and repair workshops of the SNCF. In France the locomotives were called « Locotracteur » and 525 of them formed the first series. Stronger and longer than its predecessors, the “Locotrateurs” were also able to replace locomotives which hauled light freight trains. The Y 8000 were given a paintwork in orange with brown and white areas - similar to the BB 3500 at the time of commissioning. Painted as such, most of them have gone through their careers and had carried all successive logos of the SNCF until the current "Carmillon". Some were also repainted for the operations and companies they were assigned to: Fret, Infra or even TER.